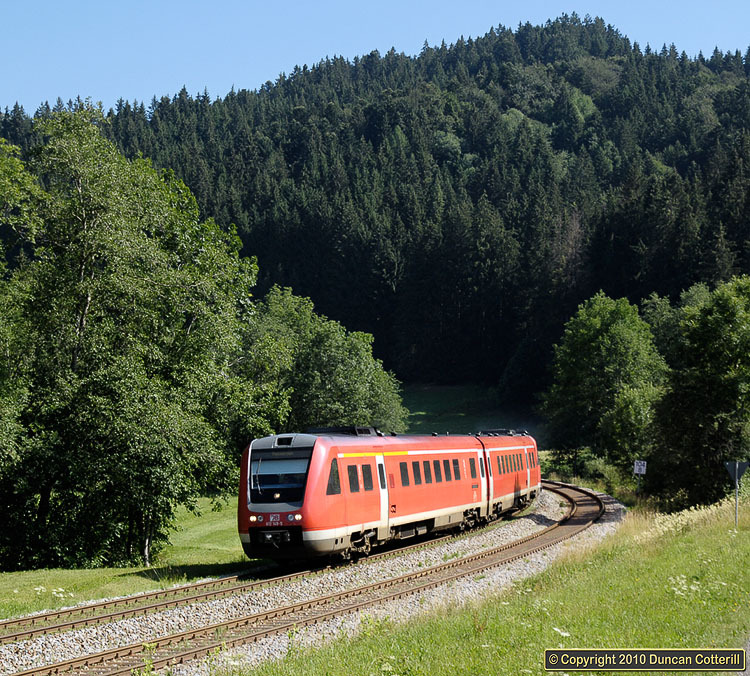 DB's class 612 tilting DMUs work a substantial number of RE and RB services in the Oberallgäu. In spite of the supposed advantages of tilt, they're no faster than the 218 worked push pull sets and a lot less pleasant to travel in with high levels of engine noise in the passenger compartment, inadequate air conditioning and no opening windows. 612.149 and 612.092 leaned into one of the many curves north of Oberstaufen while working RE32650, the 09:42 Lindau - Memmingen, on Sunday 16 July 2006. This was one of a large number of shots that were difficult to get with locomotives at the time, due to the extensive use of push-pull sets with the loco at the other end.